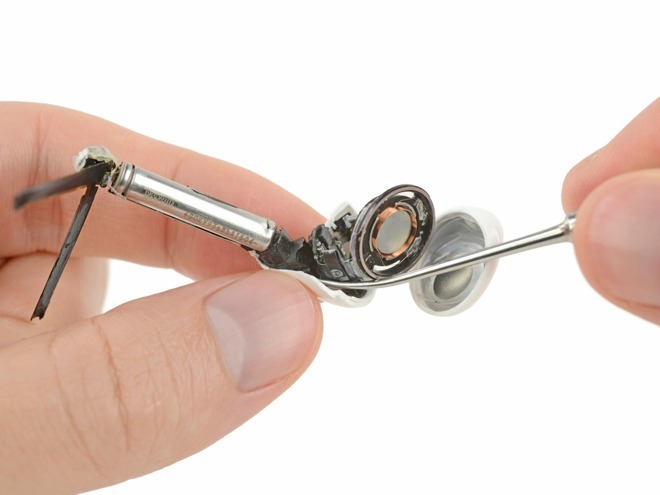 The customary teardown of the just-released AirPods refresh is a demonstration that some Apple products just should not be taken apart. In a similar manner to one from two years ago for the original model, the newest attempt effectively destroys the AirPods in the process of disassembly, due to needing to cut the casing apart and to get around the considerable amount of glue used to keep all of the components in place. 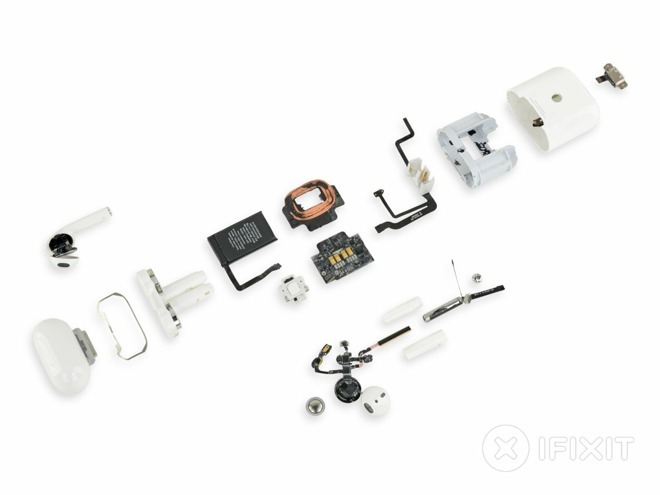 The deconstruction by iFixit attempted to ease the process by warming the accessories to weaken the adhesive, before prying open the ear section to gain access to the components. Inside the AirPods is the Apple 343S00289 chip, which is believed to be the improved H1 chip used for handling Bluetooth audio communications in headphones, as well as another Apple chip thought to be a low-powered stereo audio codec. Just as last time, Apple uses a 93 milliwatt-hour battery in each earbud. Along with the AirPods, the team took apart the accompanying case, which offered its own issues requiring the use of a vise to deform the shell enough to cut the adhesive and extract the docking tubes. While some elements are the same as last time, including the exact same 398mAh battery, the hinge is noted for being sturdier than for the previous generation. The disassembly of the case did find a new wireless charging coil, as well as a thermal pad to help cool the component, and a modified sync button that has additional solder points specifically for the wireless charging coil. The new AirPods were given an iFixit "repairability" score of 0 out of a possible ten, with the repair firm advising "AirPods are not designed to be serviced. No hardware components can be accessed without damage to the device." Despite the disposable nature and minimal score, one positive from the experience was that the construction "isn't entirely improved," with the kit potentially able to "survive an extra trip through the washing machine."